What is a Shogun Chef? From the 12th to the 19th century, Shoguns were the military might of Japan. Though the Japanese emperor held the title of leader, the real power during this time rested on the shoulders of the Shogun. Unlike the emperor, who inherited his title, the Shogun won and kept his appointment by being the most powerful military force in Japan. The Shoguns were also adept and clever politicians, winning and shifting loyalties often to keep their power intact. Today, the term Shogun is perhaps most familiar from the 1975 James Clavell novel (and later miniseries and musical) of the same name. Since then, the moniker Shogun has been used for everything from horse breeds to chef’s knives to car brands, and has come to denote power, honor, and efficiency. A Shogun chef brings the power and authority of the traditional title to the culinary world. He or she brings precision and efficiency to cutting and serving sushi and cutting, cooking and serving meat, making some of the most beautiful and delicious Japanese food presentations in the United States. Like his or her ancestors, the Shogun chef is a no-nonsense character who puts forth full effort in being the best chef possible. Of course, why listen to us ramble on when you can see a real Shogun chef in action at Shogun Steakhouse on International Drive, the best place for sushi in Orlando? 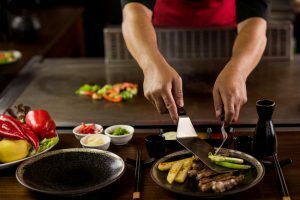 In addition to sushi, our menu features a variety of teppanyaki entrees (cooked to order tableside) and house specialties. We even have a sushi happy hour every afternoon. We’re open for dinner seven days a week. Visit us at shogunorlando.com or call us at 407-352-1607 to make a reservation.